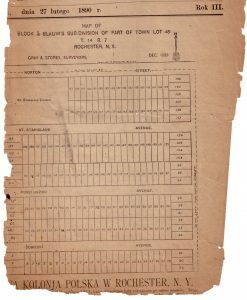 Map of Hudson Avenue/Norton Street area 1889. 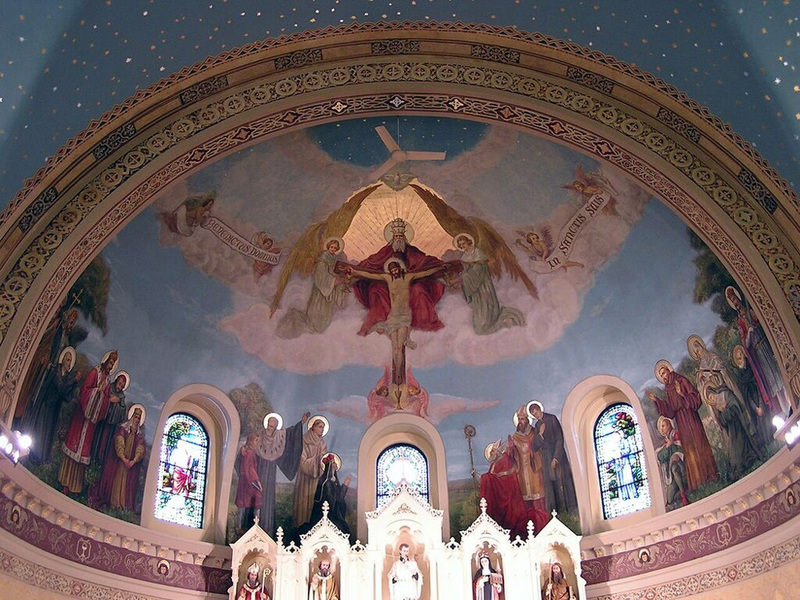 Few parishes in the Rochester area have enjoyed a more colorful history or a closer connection with their communities than St. Stanislaus Kostka. 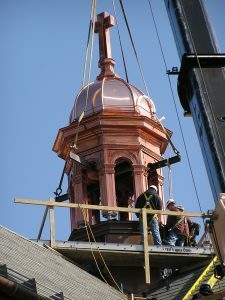 The parish is situated at the busy intersection of Hudson Avenue and Norton Street on the city’s northeast side, in a neighborhood whose streets were literally carved through fields by Polish immigrants at the end of the 19th century. When the parish was formed, Hudson Avenue was a dirt road running through a stretch of wildflowers and fruit trees, and Norton Street was a seldom-used route that marked the city’s northern line. 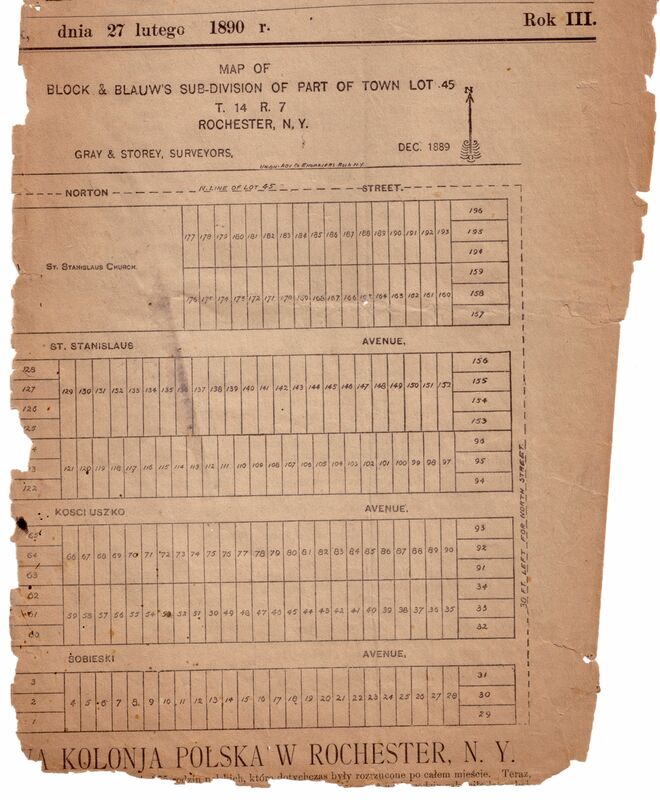 On the map of the Hudson Avenue / Norton Street area in 1889, the year Polish immigrants purchased land there for St. Stanislaus Church. They had already christened neighboring streets in honor of St. Stanislaus and the Polish heroes Kosciuszko and Sobieski. 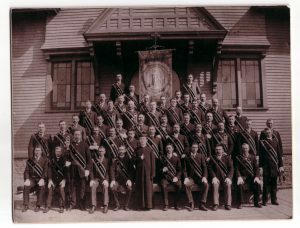 The society of St. Casimir. 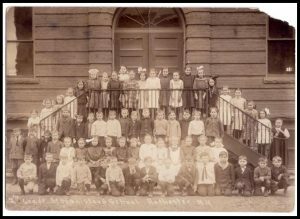 Although the area lay more than two miles from the city’s center and a half-mile beyond the nearest streetcar line, it attracted the interest of approximately 100 Polish families in 1889. To these immigrants, the area represented an expanse of land on which they could build homes, a parish, and a school – a community where their language could be spoken and their traditions maintained. The Society of St. Casimir (pictured here with St. Stanislaus’ first pastor, Rev. Teofil Szadzinski) represented the founding families of St. Stanislaus Church. Original church of St. Stanislaus Kostka. 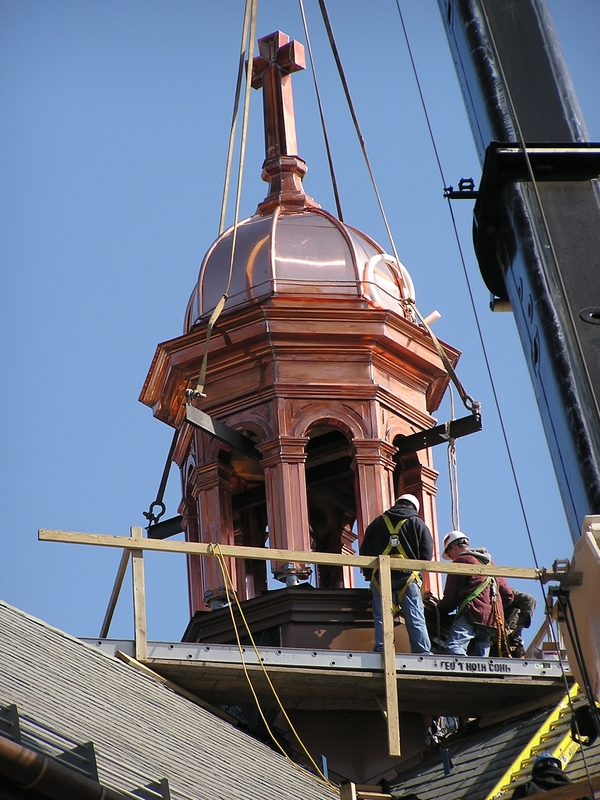 The original St. Stanislaus Church, a modest wooden chapel erected in 1890, was the first structure built on this tract of land. During the next century, Polish families formed a neighborhood of homes, tree-lined streets, shops, and social clubs in the area that became known as Polish Town. The cornerstone of the original church of St. Stanislaus Kostka, still stands in the rectory yard, marking the buildings location on St. Stanislaus Street. 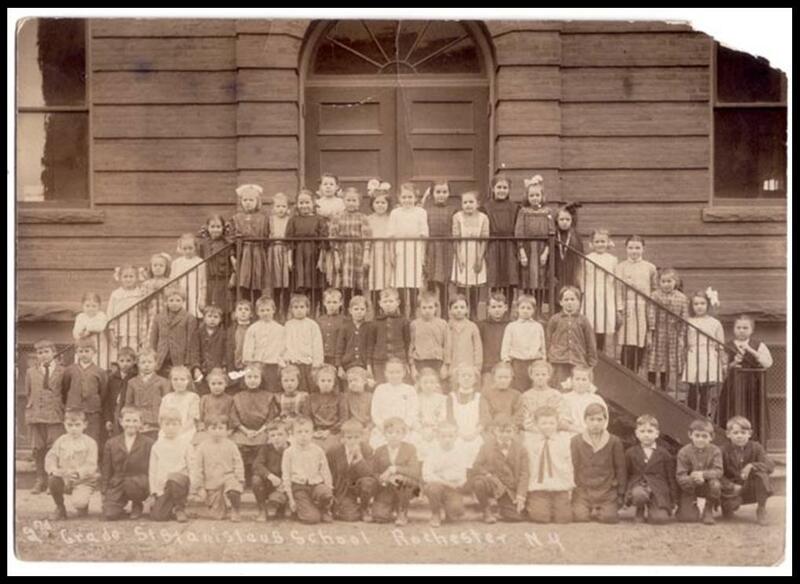 Second grade class of St. Stanislaus School, 1912. 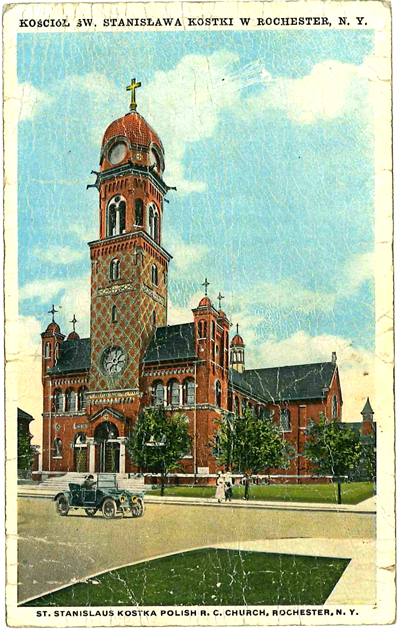 Throughout its history, St. Stanislaus Parish has served as a spiritual home to thousands of people and as the heart of Rochester’s Polonia. 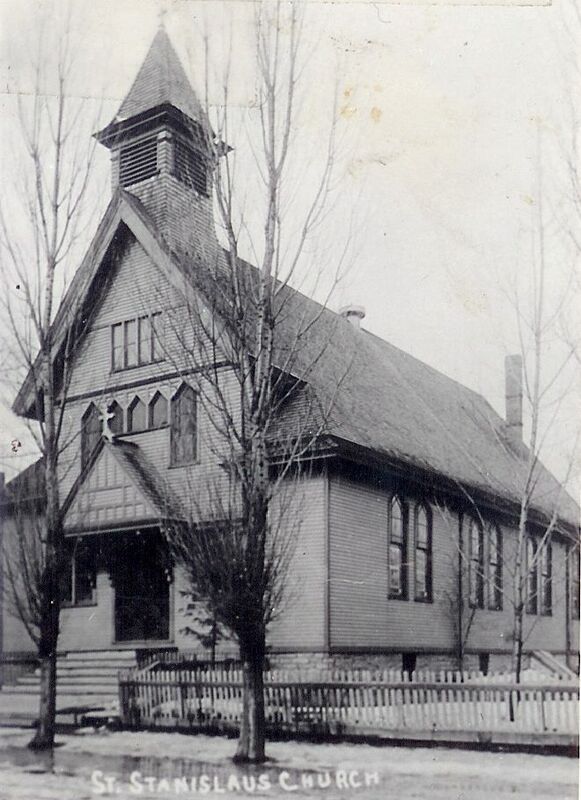 Our school, opened in 1897 and operated by the Sisters of St. Joseph until it closed in 1992, provided a strong foundation to several generations of parish and neighborhood children. Shrine of Our Lady of Czestochowa and St. Pope John Paul II. Today, cherished traditions rooted in the history of the parish are joined with new initiatives of ministry and community life. 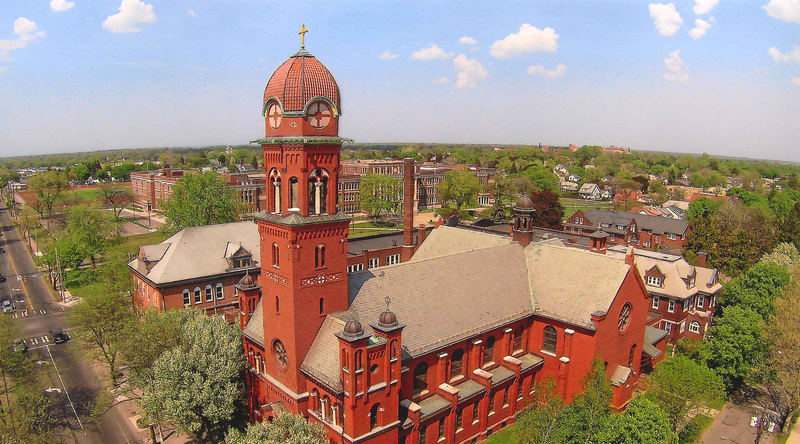 Our congregation includes families who have worshipped at St. Stanislaus over several generations, immigrant families who have arrived from Poland in recent decades, and people of many heritages who are drawn to our parish circle. Our schedule of worship services includes Masses in both English and Polish. We provide religious education to young people, Polish language instruction for children and adults, outreach to the infirm and homebound, and assistance to local charities and causes in Poland. Our parish societies engage in much good work, and community organizations including the Polonia Civic Centre hold activities on our grounds. 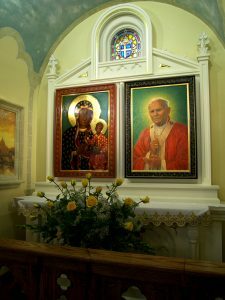 Our church’s newest shrine of Our lady of Czestochowa and St. Pope John Paul II, was dedicated in 2008.